They would like to interview Park users this weekend, Saturday, March 29th and Sunday, March 30th. A busker is someone who performs live on the streets or in parks/public places with objectives of entertaining people while at the same time trying to solicit donations. 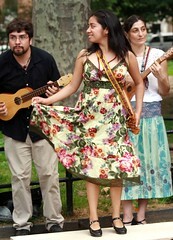 These people are also known as street performers. Busking is an English term that was coined in reference to the chimney sweeps who would perform on the streets after cleaning chimneys and pass out their large top-hats to try and collect tips. Love that! Please contact them. It’s a start. The New York City Council is at last showing some oversight of the Parks Department — around artificial turf. This substance has been placed by NYC Parks Commissioner Adrian Benepe in over 130 natural soil and grass fields across the five boroughs. (Thankfully, not at Washington Square Park – thus far.) People have questioned artificial turf being used in place of grass, for a number of reasons beginning with the fact that it sounds like a really bad idea – after all, it’s made from recycled rubber tires. But there are genuine health and environmental concerns. So … is the lesson that when you’re young you get to frolick around on your artificial turf rain or shine? … Is it so terrible to learn that sometimes we have to alter our schedules because of mother nature? Probably best when we are also playing amidst “mother nature” and not along potentially harmful synthetic turf — which I hope we will see out of our city Parks soon. **If you’d like more information on Bill Crain’s research with Dr. Jim Zhang on toxic chemicals in synthetic turf, or Crain’s summary of how natural settings benefit children’s psychological development, you can email him at Billcrain -at- aol.com and he will send it to you. Another story appeared over the weekend in the New York Times(3/22) “In a City Park, a Crime Against Nature” about the killing of 35 cedar trees in Inwood Hill Park. I’m amazed at the ability of the Parks Department to spin things. Well, yeah. It was kind of disheartening when the Parks Department slaughtered 11 old trees at Washington Square Park for the misguided decision to “align” the fountain with the Arch. It was kind of disheartening when the Bronx lost 300 to 400 trees at two parks for building of a new Yankee Stadium. It was kind of disheartening when Parks Department destroyed 105 trees at East River Park during its “reconstruction.” It was kind of disheartening to learn that Parks Commissioner Adrian Benepe wants to cut down 14 majestic trees at Union Square Park to make room for Danny Meyer, who is also on the board of the Union Square Partnership – the local BID(business improvement district), to have a restaurant there in the historic pavilion. If the 35 trees slaughtered at Inwood Hill Park are deemed arborcide, then I’d say that Parks Commissioner Benepe has quite a record on his hands. How is it against the law for a stranger to kill 35 trees on City Parks land and yet for the Parks Department — in the interest of privatization of our Parks — to ax multiple numbers (tens. hundreds. thousands.) of healthy trees, that is just fine? How does one qualify as arborcide with a fine and jail time and the other doesn’t? Commissioner Benepe stated at the City Council hearing on Wednesday 3/19 that the Parks Department is “committed to replacing parkland” with tree replacement of 8000 trees “to mitigate the ones cut” in the Bronx for the Stadium. 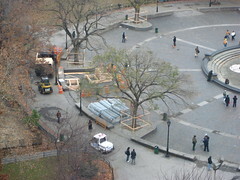 At Washington Square Park, in Phase I alone, they stated up to 16 trees are up for chopping (11 thus far) but there would be up to 39 REPLACEMENT trees. That’s 23 additional trees. So it’s all good — according to the Parks Department and the City Council. Except it’s not. 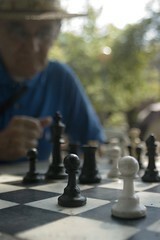 Parks Department Commissioner Benepe’s spin is clever and it’s manipulative. He cannot cavalierly advocate for the destruction of our city trees — and for the destruction of our city, via endless privatization and homogenization of public space — and then state that it’s magically okay because there will be “new trees planted.” The Parks Department is supposed to act as STEWARDS for the trees, NOT — as per Mayor Bloomberg’s directive — for Danny Meyer and the Tisch Family and NYU. When will this end? And how do we get this to stop? New York City Parks Commissioner Adrian Benepe is responsible for the felling of eleven 50-to-100 year old trees at Washington Square Park thus far. 300-400 trees were destroyed from two Bronx Parks to create the new Yankee Stadium. 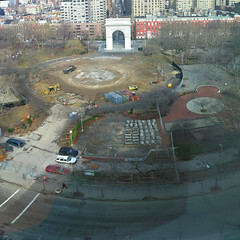 Benepe has proposed killing 14 trees at Union Square Park to make additional room for an upscale restaurant. Yesterday, at the City Council hearings on the Parks Department budget, I discovered that he wants “thousands” of trees to hit the chopping block — according to activists in Queens — to put in the controversial and potentially dangerous artificial turf that he is such a fan of at Ridgewood Reservoir/Highland Park. If one gives the order, yet doesn’t hold the ax, isn’t it the same? Police and parks officials are hunting for a “madman” who chopped down 30 young red-cedar trees in Inwood Hill Park with an ax last week. 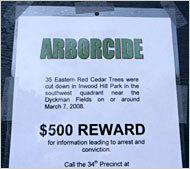 Parks Commissioner Adrian Benepe said this is the second case of arborcide in the upper Manhattan park. The trees were planted in 1996 as part of a plan to reestablish woodlands in the 196-acre park. Parks workers found the small trees, between 4 and 8 feet tall, on their sides Thursday. “It’s really discouraging that a madman with an ax would deliberately kill trees,” Benepe said. “It’s crushing,” said Jennifer Hoppa, administrator of Northern Manhattan Parks. Police are investigating, and parks officials are posting flyers and offering a $500 reward. Under the city’s “arborcide law,” anyone who damages, destroys or otherwise harms a street tree or park tree faces a $15,000 fine and up to one year in jail. Anyone with information should call the 34th Precinct stationhouse at (212) 927-2640. “But if you see somebody with an ax or a saw, call 911,” Benepe said. Alan Gerson — the NY City Council representative for District 1 in Manhattan, which covers Washington Square Park — was missing in action Wednesday March 19th at the City Council hearing on the Parks Department and its Preliminary Budget. Alan Gerson is on the Parks & Recreation Committee of the City Council and all of his colleagues on the committee showed except for Gerson and Letitia James (Brooklyn). Since Washington Square Park is a ‘hot topic’ for his constituents, we find it a bit odd that he would miss this presentation by the Parks Department and a chance to ask them some questions. 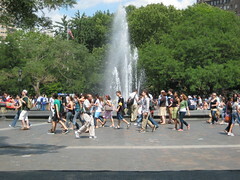 (Although Parks & Recreation Committee chair Helen Foster – Bronx – noted that “if Alan had shown up,” his topic of focus was to ask Parks Department Commissioner Adrian Benepe about “the bathhouses.”) Since the budget for the City’s redesign of Washington Square Park’s Phase I alone has more than doubled from $6 million to $13 million (the project was initially budgeted at $16 million TOTAL), it seemed like a perfect opportunity for Council Member Gerson to quiz Commissioner Benepe on this topic. Council Member Gerson also failed to show up for an important Community Board 2 meeting in late December at which the Washington Square Park “renovation” was discussed and in which he was supposed to report back on whether he was releasing key City Council funds – under his discretion – for the Washington Square Park project to the Parks Department. (He sent his aide who read a statement which did not answer this question. His office now says that they told the community at that time that the funds were being released). 11:30 a.m. Parks Department Presentation of Preliminary Budget & City Council member’s questions. We’ll report back on Thursday! Figures don’t lie. But a lot of liars figure. * The EXISTING entire plaza is currently 51,223 square feet. * The PROPOSED plaza area will be 39,419 square feet. That’s an 11,804 square foot reduction, right in their official plans. * The old and expansive interior plaza was 27,650 square feet. * The PROPOSED interior plaza will be 20,662 square feet. It was a lie when George Vellonakis, the new plan’s “designer,” told the Community that the reduction in public space would be five percent. The shrinking of the public space in Washington Square Park has a tremendous impact on how it will be used, which in turn impacts on the character of the park. Who gathers there? HOW will they gather? And how will the new, constricted space be regulated? Will musicians need official approval? Will performers and political speak-outs be required to obtain a permit? Will the free spirit of the Park be shredded and destroyed? And maybe that’s Mayor Bloomberg’s whole point.